Pirrama Park, Pyrmont (formerly known as Pyrmont Point Park) won the 2010 Walter Burley Griffin Award for Urban Design. Formerly the site of the water police, the old wharf pylons have been incorporated into the new design. Pirrama means 'rocking stone' in the Gadigal language. The headland is surrounded by Johnstons and Jones Bays. Below are photos I took in May 2007. The park has now been thoroughly landscaped and is regularly used for food and wine festivals and other local events. One of the main ones is the Mudgee Food and Wine Festival held in May every year. Unbelievably, I've had something else planned for this weekend for the past 6 years! I hope to finally attend the festival next year & to see the new work done on this lovely inner city park. The harbour promenade featured a sculpture created by Jennifer Turpin & Michaelie Crawford. Tied to Tide (below) is an "aquatic instrument" with eight arms of recycled hardwood beams and red ladders that play "the winds, tides and waves to independently rise, fall, pivot and rotate." According to my Top 10 Sydney, Tied to Tide is no. 10 in our Top 10 Public Art list. When I first moved to Sydney I used to get very confused about which headland ended up in which bay and how to get from one to the other. Pirrama Park is the green patch at the top of this map. Off to the left is Johnston's Bay, which is spanned by the glorious ANZAC Bridge. The Sydney Fish Markets take up the big grey patch of land in Blackwattle Bay circled by the Western Distributor (route 40) which is the official name of the road using the ANZAC Bridge. Directly opposite the Fish Markets is Blackwattle Senior Secondary College where my eldest stepson goes to school. Jones Bay is the little bay off to the right of Pirrama Park - Jones Bay Wharf juts out in the middle of it. Keep heading around to the right and you end up in Darling Harbour. 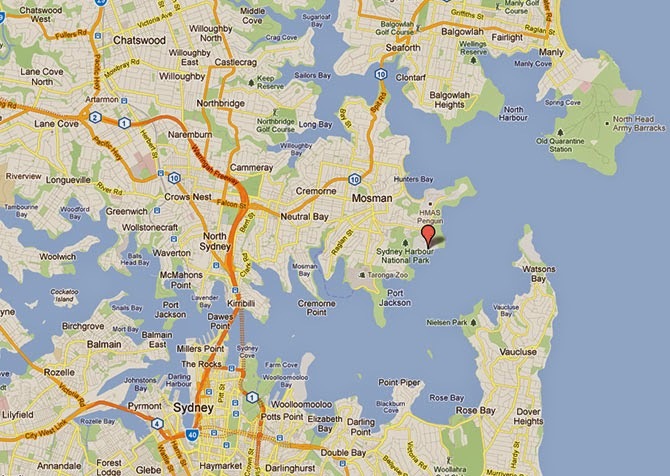 This next map might give you an idea of just how many bays and coves line Sydney Harbour. 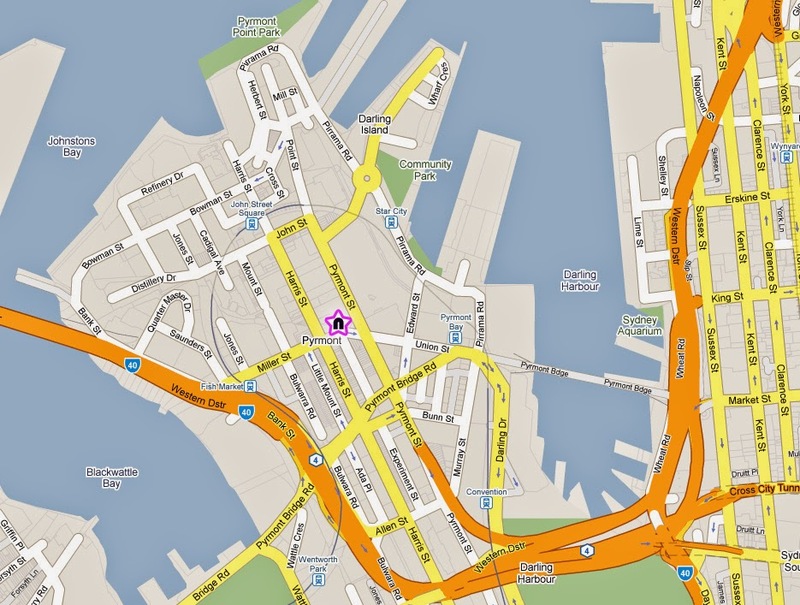 Pyrmont is found in the bottom left hand corner of this map. We live in Balmain just across from Johnston's Bay. Our front verandah has a great view of Cockatoo Island & Woolwich. Goat Island is the green spot under the words Port Jackson (near Balmain East). Clark Island is further to the east off Darling Point (a much smaller dot of green). And Shark Island is off Point Piper in the middle of the entrance to Rose Bay. The entrance headlands into Port Jackson are imaginatively called North Head and South Head. The big one in the middle where Mosman and Taronga Zoo are is called...you guessed it...Middle Head! North Harbour takes you into Manly & Middle Harbour takes you under the Spit Bridge (route 10). Sydney Harbour takes you under the Sydney Harbour Bridge (between Dawes Point & Kirribilli)! What wonderful scenes! You had me at Food and Wine Festival...and then proceeded to astound me with the gorgeous sculptures and water views. Thanks for sharing. Beautiful photos of a lovely setting. Just looking at the water is calming, isn't it? I hope you're able to go to the next festival -- it sounds like fun! Ooops! 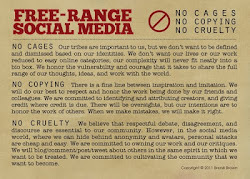 I meant to leave the link to my Saturday Snapshot post. 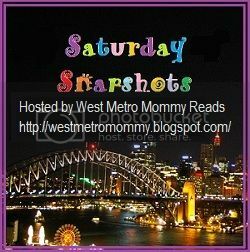 Here it is: SATURDAY SNAPSHOTS. The sculptures look awesome. I'm pretty sure we probably floated right by it on our harbour cruise last year but never saw it. I'll know to look for it next time. Great pictures! I almost feel like I've been to Syndey after seeing all your pictures!